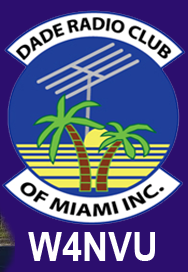 March 2011 Meeting Minutes – W4NVU – Dade Radio Club of Miami Inc.
Meeting was called to order at 20:09 with 18 present. Ernesto presided over the meeting and welcomed everyone. The meeting was broadcast live on the air tonight from the EOC. Testing is being done in the other room. The microphone was passed around the room and everyone took turns and stated their name and call sign. Ernesto welcomed everyone again. We have a quorum. We do not have a guest speaker tonight. Ernesto reminded everyone present tonight to sign in. Minutes were posted but not reviewed. Tabled until next meeting. Last month we could not have a meeting because we had no quorum and it had to be cancelled per the By-Laws. Ernesto will contact Esther to obtain a list of who has paid so that we can update the paid members list. Merritt spoke about the 147.000. It’s working. There are new people on it. Any problems contact Merritt either via email or call him. Carl was not present. Merritt spoke about the 444.200. It’s working. Robert was not present and no one spoke about the 220.000. Virgil spoke about the Ham trailer. It is at his house. The trailer has been taken over by Coral Gables ARES/RACES. We need to work on changing the inside and fix the roof. Keep reading South Florida Hams to keep up-to-date. The tag is up-to-date and good until June 2011. There is no title or insurance. There was a discussion about the tires and Luis advised that if we change anything, it needs to be approved by DOT. The trailer needs a 2 2/16 ball. It is very heavy and has electric brakes. Virgil suggested a work party at his house. Ernesto appointed a Nominating Committee for each elected officer. We will have the election at the April meeting. The Nominating Committee is Andy Pichs and Dave Thompson. They will meet and give us a list of candidates at next month’s meeting. Ernesto will get a list from Esther of the active paid members for them to choose from. Dave announced that Julio Fuentes passed his Tech. Congratulations Julio! Ray announced that next month there is a conflict with our meeting room. He suggested that we meet outside on the new deck and Tom can give us a solar demonstration. Everyone agreed. MS Bike tour was discussed. Information will be on South Florida Hams. Matt is the contact person. It is May 14 and 15th. Andy will see to it that the communications work. We need Hams for the rest stops. Going to try to have 40 motorcycle Sags this year in addition to the 25 – 30 other vehicle Sags. SAG stands for Support and Gear. Jason said that he and his wife worked the ING Marathon this year for the first time and they had a great time. Ray explained how to get on South Fla Hams you need to join Yahoo Groups. You go to SouthFlaHams.com and sign up to join. Other announcements, – Armando said he was glad to be back. The Red Cross is holding a 1 hour basic treatment and CPR class every hour at 3 different locations, not at the Red Cross facility. Go to www.soflredcross.org for more info. It is a Save A Life campaign honoring Ms. Giffords who was shot in Arizona. Ernesto asked if there was any other business. With no other business, Ernesto thanked everyone for coming. A Motion to close the meeting was made by Caesar, seconded by Dave. Voted and passed. The DRC meeting was adjourned at 20:55 and the meeting was taken off the air.